45 minute tours. Departing Preston's dock. Sign up at the dock 30 minutes prior to departure. 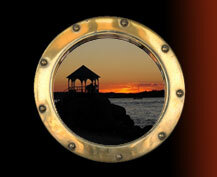 Schedule dependent on weather and sea conditions. Visit our calendar for an updated schedule. GLORY is SOLAR POWERED! In 2009, with the assistance of Eastern Energy Systems and the science class at Riverhead High School, under the guidance of Robert Jester, GLORY went Solar becoming the first Coast Guard inspected tour boat in the United States operating with solar power. Solar cells were placed on the roof at Preston's and these solar cells charge GLORY's batteries. We have eliminated our carbon footprint, demonstrating the value of solar power in a meaningful way. 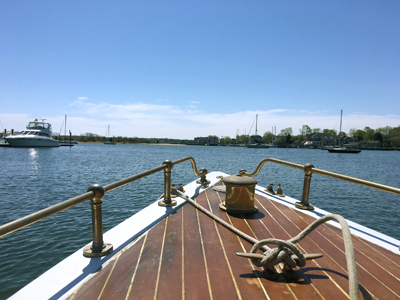 GLORY, an environmentally-friendly vessel, has delighted adults and children alike with whisper-quiet and fume-free tours of the nooks and crannies of the Peconic Bay since 1999. GLORY takes visitors back to a bygone era with its classic lines and elegant mahogany and gold-plated trim as it glides along the bay. Since 2008, GLORY has endeavored to give back to the community. We run free art, science, and writing programs for local children in conjunction with the Greenport Elementary School and the libraries of the North Fork. Glory Going Green, Inc., a not-for-profit, sponsors these free programs. Thanks to generous contributors, hundreds of youngsters have already taken part in our free art, science, and writing programs.